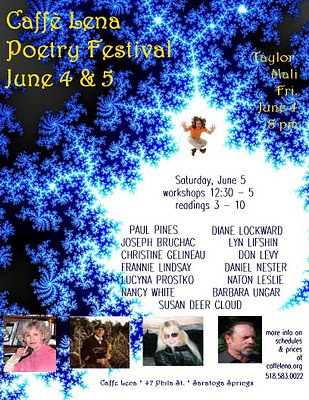 When I began writing poetry, the second summer conference I attended was at The Frost Place in Franconia, New Hampshire. I returned for the next 7 summers and then moved on to the Seminar there. I attended other conferences, other workshops, but The Frost Place always held a special place in my heart. I don't think I'd be too corny if I said that it has been one of the most significant influences on my life and who I am. From the first time I stepped foot on the grounds, I knew I was in a special place. 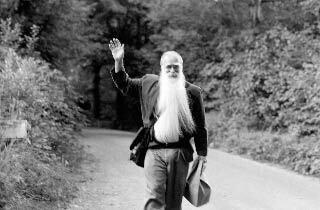 I was greeted by a man with a long flowing white beard. That was Don Sheehan, the director. Don was the soul of the place. Everything good there flowed out from him. So I was so sorry to learn of his death this week. He died, age 70, at home in South Carolina on Wednesday morning, May 26. David Graham posted a lovely tribute to Don on Facebook. With his permission I am reposting it here. I think it will give you a sense of just how special Don was. And will continue to be. I was very sorry to learn yesterday about the death of Donald Sheehan, founding director of The Frost Place in Franconia, NH. For over a quarter of a century Don ran the programs at The Frost Place, including the Frost Festival, the Frost Museum, and the Poet in Residence program. Not a poet himself, Don was a legendary teacher and scholar of English, Russian, and classical literature. He was immensely knowledgeable about and supportive of the art of poetry. Even more importantly, he set the tone of the Frost Place and its programs: non-hierarchical, community-minded, informal but serious and rejuvenating. At the Frost Festival each summer Don usually made a short speech in the beginning asking everyone to agree NOT to make any life-altering decisions for at least six months after the week in Franconia ended. He emphasized that the Festival was a special place and time, and was not "real life." I gather that he felt obliged to make such a disclaimer because so many participants went right home afterward and quit their jobs, initiated divorces, and so forth. There was virtually no Po-Biz at The Frost, and any celebrity poets who put on airs or otherwise did not enter into the spirit of the place were not asked back. Everyone who ever went there came away realizing that Don was as responsible for its special quality as anyone. As Donald Hall put it, The Frost Place has always been dedicated not to poets but to poetry. Don Sheehan was a quiet, deeply religious and humble man, so it's hard to describe what a magnetic personality he had. As Sydney Lea remarks, "when Don entered the room, the atmosphere calmed and people began to behave better." I first attended the Frost Festival as a student in 1980, and returned a number of times over the years as a faculty member in various programs, or just to visit the place and friends who were there. One of the highlights of my life was being asked, in 1996, to live in Robert Frost's farmhouse for the summer as a Resident Poet. I got to walk Frost's woods, sit in his writing chair, enjoy the amazing White Mountains scenery, and soak up the atmosphere where he wrote some of his best early lyrics. But by far the best part of the summer was coming to know Don and observing at first hand how he directed the place and its programs. My teaching and my poetry were forever changed as a consequence. "The heart of the conference is the workshop. Thus, you will need to work from the heart. There is a natural urge to hide: a swarm of anxieties, both our own and others' that we pick up on. Above all, there is an overwhelming 'need'--a false hunger--to be praised, coupled with a hair-trigger impulse to envy anyone else whose work seems immediately praiseworthy. Thus you are likely to find yourself whipsawed between the hunger to be admired and the impulse to envy those who are admirable. Thus, your work at this conference is to make the art of at least one other person better and stronger by giving--in love--all your art to them." The official obituary from the website of The Frost Place can be read here. I am delighted to be part of this festival. I've read twice before in Saratoga Springs, once at the library and once at Caffe Lena. It's a wonderful area, full of poetry lovers. If you're anywhere near there next weekend, please join us. For the second year running Caffè Lena in Saratoga Springs, NY, will devote a weekend to the art of the spoken word, with more than a dozen accomplished poets offering words of freedom, beauty, challenge, and revelation. The festival will open on Friday evening with a full-length performance by renowned NYC slam poet, Taylor Mali, and will continue on Saturday with workshops and readings throughout the afternoon and evening. Workshops will take place in the Glasby and Susman meeting rooms at the Saratoga Springs Public Library. $10 ticket for as much or as little poetry as you like! Readings will take place at Caffe Lena, 47 Phila St. Check the website for workshop descriptions, directions, and more information. 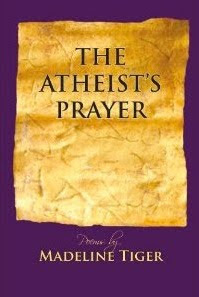 This past Sunday I went to a literary salon held in celebration of the publication of The Atheist's Prayer, a new poetry collection by Madeline Tiger. This event was arranged by Jessica deKoninck and held at her house. Twenty people attended—friends, students, and fellow poets. Many of us there could claim to be all three. Madeline was my very first poetry teacher, probably about 20 years ago. She led the first workshop I ever took. I sat there nervous and not sure I belonged. She made me believe I did. That belief has been a precious gift to me all these years. Each week Madeline brought in hand-outs, poems, and prompts. It was like my birthday every Saturday for the duration of the workshop. We became friends and fellow poets. When my first book came out, Madeline had a new book out, so we had a joint party. That, too, was special. This Sunday we had snacks and conversation and then a reading by Madeline. I think the literary salon just might become my favorite kind of reading. I love the intimacy and the careful attention paid by the audience to the reading. We were there to pay tribute and to enjoy. And we did. Please enjoy this one-minute video of the event. And now enjoy the book. Several months ago novelist Lauren B. Davis hosted me at a poetry reading at Trinity Church in Princeton, NJ, where she is writer-in-residence. 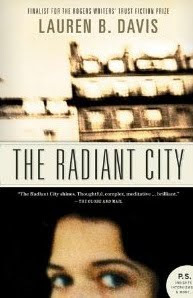 Because I admired her energy, candor, and intelligence, I bought and read her novel, The Radiant City. The same qualities I found in Lauren, I found in the book. It's one of those books you don't want to end. History and current events are brilliantly woven into the plot, which is complicated and dark, but with an ending that suggests the possibility of redemption for the cast of broken characters. Since both Lauren and I belong to the social network, She Writes, I decided to do a piece for their ongoing feature, "5 Questions." In this feature, one member asks another 5 questions on whatever topics the interviewer chooses. DL: The single-sentence first paragraph of The Radiant City—“The night is the wrong colour. "—reached out and pulled me right into the novel. The next paragraph begins, “The first sound he heard was the horses. They sounded like eagles torn apart, like metal gears stripping, like speared whales.” This is an intense and exciting opening. As a poet, I also found it poetic. How consciously do you work on style? LD: I’m flattered you use the word “poetic” as I don’t consider myself a particularly poetic writer. I have enormous admiration for poets, and language-driven prose, and often read poetry as a sort of mental stretching exercise before I start my writing day. However, in my own work I’m more obsessed with character than language—with what makes people tick, with their blind-spots, their frailties, and their yearnings. Everything stems from that and any linguistic pyrotechnics are in the service of revealing my characters' interior worlds, and their conflicts. For me, the more I concentrate on style, the less authentic it turns out to be. The best writing comes from a deep place in the subconscious, and is then polished by the conscious mind. When I write it’s a sort of meditative state in which I “dream” a scene and allow whatever’s down in the dark tangled roots to bubble up to the surface. I get a scene on paper noting as many significant sense details as I can, and then go back and craft the language, the images, the “mechanics” of the scene, if you will, to serve the narrative. ND: Your book What Feeds Us made me incredibly hungry for lush and savory food. Is there a dish or a recipe you would suggest that would ease my cravings after having been teased line after delectable line with your descriptions of flavor? DL: In the poem “Anniversary” the speaker talks about Bocconi Dolci, an absolutely delectable dessert that’s guaranteed to satisfy every one of your cravings. 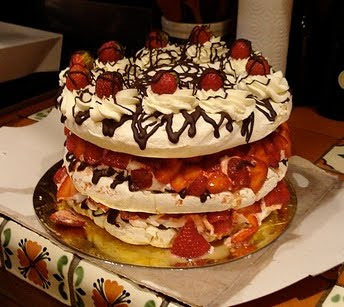 Three layers of meringue, each covered with melted chocolate, whipped cream, and strawberries. The sweetness of the dessert is at odds with the sadness of the poem, but that’s why I chose it for that poem. Here's what this delectable dessert looks like. I can make this! It's my favorite dessert. And here's the poem referred to in my first response. This past Sunday, May 16, was the annual Poetry Festival: A Celebration of Literary Journals. I've been running this event for seven years now, each time at my local library. Seven years ago I thought it would be a one shot thing. But it went so well and the librarians wanted to do it again, so we did a second year. Same story. I invite 12 editors to come with their journals, all print journals. They set up in the Reference Room, each editor getting half a table for their journals, subscription information, and submission guidelines. 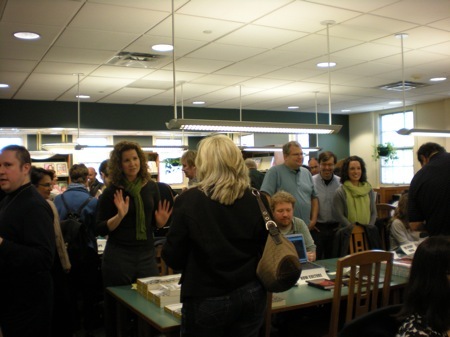 Editors sell their journals and talk with visitors throughout the 4-hour event. I also ask each editor to invite two poets to come and represent the journal, so we end up with 24 poets, each of whom reads two poems. The readings take place in the Community Room which holds 80 people, plus standing room. That room stays close to full throughout the event. Readings are arranged into segments of 3 journals, 6 poets each. In between, we have 20-minute breaks for browsing the journals and the poets' books. The books are for sale at the Circulation Desk. We had a terrific line-up of poets this year. Actually, we always do! It's a wonderful opportunity for us to hear some favorite poets and meet some poets new to us. Many of the poets tell me that they've never had the chance to read in front of so many people. Other nice things fan out from the festival. For example, other readings are booked as we always have some venue hosts who hear new voices and run to book. Editors get new subscribers and later report submissions from poets sending to them for the first time. Certainly one of the most exciting results this year was hearing poet Joe Weil—the only poet who has read at all seven festivals—read from his new book, The Plumber's Apprentice, just published by New York Quarterly Books. Even more exciting was learning that the publisher, Ray Hammond, had heard Joe at last year's festival and approached him about submitting a manuscript. Thus, the book. Another one of this year's pleasures was hearing David Crews read for us, his first time at the festival as a poet though he's been part of the audience before. David is a high school English teacher and a fine poet. I used my new Nano to grab his reading of one poem. Then I made it into a movie of just over one minute. Enjoy. Yesterday's festival went really well. In spite of losing one of our 24 poets earlier in the week and two more poets and an entire journal on Saturday, everything worked out very well. One of the editors read for one of the missing poets who was ill, and we used the extra time left by the missing journal for more browsing and poetry conversation. 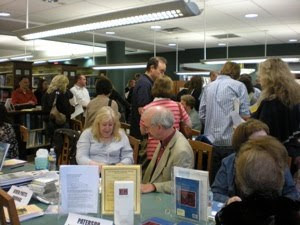 We had a good turnout, heard lots of wonderful poetry, sold journals, sold books, had a lot of fun. There are dozens of photos posted on Facebook, but here's a quick video I took with my new Nano. I love that Nano! This is my first time using it and I'm very pleased with the results. The picture quality is good (better in the room that had more light) and the audio is surprisingly audible. I'm posting this now just to give you a sample of the day. I'll be making a longer video with pictures of all the editors and poets. I don't think that the job of proofreading the galleys can be called "fun," but it's a job that has to be taken very seriously. 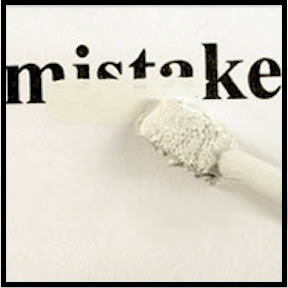 The mistakes you miss in the galleys will become part of your book, there for everyone to see, especially you! So this is a job that needs to be done painstakingly and repeatedly. It can't be rushed and it can't be done when you're tired. I recently finished this job for my coming-forth-very-soon new book, Temptation by Water. The galleys for my first book, in 2003, came in hard copy through snail mail. Likewise for the second, in 2006. But this time it was all done online. So one morning the galleys popped into my inbox, one long pdf file. In the pdf the font looked really big, but when I printed, the font looked really small. My heart sunk a bit. I like a good-sized readable font. Fortunately, my publisher agreed that it needed to be larger. Since making the font larger would alter page breaks and pagination, I did the first reading just for typos and previous mistakes that had escaped me. I read the print-out and then I read again on the screen. Made of list of edits and sent it back. Within a week I received the next set of galleys. The font was larger and more readable. I read for page breaks and line breaks. I found a few unwanted line breaks that resulted in orphans. I again printed out and re-read for other mistakes I might have missed the first time around. I noticed that for some unknown reason all the colons appearing after journal names on the Acknowledgments page had changed from italicized to non-italicized. Since the journal names are italicized, I wanted the colons to be italicized also. I very carefully matched up page numbers with the Table of Contents. Found one mistake there. Made another page of edits and sent it all back again. The next morning I received the corrected galleys. First thing I checked was those pesky colons. I found two that had been missed and had not been italicized. Everything else had been fixed. Unless, of course, I missed something. I quickly scanned through the whole thing again. And fired it back one more time. From there it went to the printer. Now I'm just hoping those two colons have been italicized. I know that if they're not no one but me will notice. But I will notice! I have a theory that every book has at least one mistake and that we need to love our mistakes. I believe that's true, but I'm still hoping for no mistakes. And if there is a mistake, I hope I don't find it immediately—or ever. Next comes the proof copy in book form. I've often admired Deborah Bogen's poems in journals. 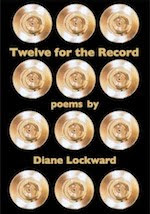 I was delighted when I learned that she had a new book out and also delighted when she agreed to be this month's poet for The Poet on the Poem. 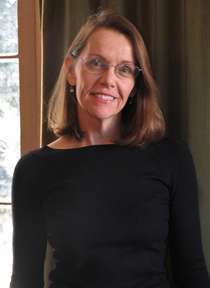 Deborah Bogen's poems and reviews appear widely in journals including Shenandoah, The Gettysburg Review, The Georgia Review, Margie, Poetry International, and Field. Her work has been featured on Poetry Daily and Verse Daily. Her full-length collection, Landscape with Silos, won the 2005 X.J. Kennedy Poetry Prize (judged by Betty Adcock) and was released by Texas Review Press in August 2006. 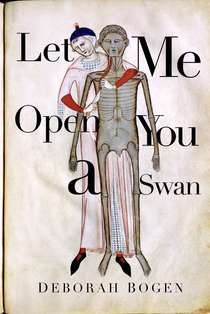 Her new book, Let Me Open You a Swan, won the 2009 Antivenom Prize from Elixir Press. She's a former California girl, now living in Pittsburgh where she runs free writing workshops in her home. Today's poem comes from Let Me Open You a Swan. that he come here unharmed.
. . . . . the hour of our last parting. Grant that he come, penniless or resurrected. DL: Your poem strikes me as a prayer for a brother’s return and resurrection. Tell us about the nature of the resurrection and your use of implied biblical allusions. DEB: I had a stepbrother who I met for the first time when I was 15 and he was 11. Despite our ages we were almost immediately bonded as siblings – we were that kind of personality match, I guess. We were close and we always knew the hour of our first meeting. When I was writing this poem, he was dying of complications of Hepatitis C. He had been on the liver transplant list for some time, and I found out later was denied a new liver because he had continued to drink. I was sad, but I actually understood the transplant committee’s decision. Anyone who keeps drinking with a failing liver does not actually want the transplant. My brother didn’t. That was a hard pill to swallow. I wanted him to stay with me on this planet, to be “resurrected” with a new liver but he had been sick a long time. He wanted to let go. The biblical allusion falls out of the Christian claim of Jesus’ resurrection, of course, but the idea of coming back, of some sort of rebirth precedes Christianity. I was raised in a Christian Church and the part of that I loved was the exposure to the King James version of the Bible. A lot of that language is gorgeous — spell-binding you might say. When I found myself falling out of the religious life, when I was unable to take a great deal of it seriously, I still loved the language and I simply refuse to give it up. DL: Your title seemingly has no connection to the poem, yet I feel it powerfully. Was there ever a point in your drafting when a phone was in the poem, when its ringing disturbed the night? DEB: Every Monday night I write with a group of poets and fiction writers in a workshop in my living room. We all write together to a prompt and then read that work out loud. I run the group and sit by the phone. It is my job to remember to turn it off. But the phone itself is right there and in my mind as a potential disturbance. 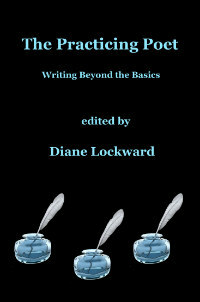 One night the prompt included something about “gesture” – to use gesture in the writing, perhaps to define or develop a character, I can’t quite remember. In any case I found myself writing “The rudest gesture is the phone that rings in the night.” The possible implications are obvious, but I found that the phrase itself kept coming back to me. It took months to realize it was related to my fears for my brother, to my desire to not get the call I knew had to be coming. DL: I’m interested in your use of anaphora to structure the poem. “Grant” begins four lines and is embedded in two additional lines. The repetition adds rhythm and a tone that is both demanding and begging. Talk a bit about the craft decision that went into the use of this deceptively simple device. DEB: It might be fair to say there was a decision to let that language stay in, and even overtake, the poem, but it came on its own in the first draft when I was writing freehand with a pen in a notebook. You are quite right to call out the demand and the begging which I think are part of our most desperate hours, when we are half imploring and half stamping our feet as if some kind of tantrum might turn the tide. I was worried about it sounding too Christian, too prayerful, but I used the repetition to invoke the casting of a spell. Can I cast that spell? Can I hypnotize the universe into supporting my project? Probably not but that impulse has fueled magic and religion for a long time. It is a deeply human to wish to do it, I think. I also used it to allow a heart heavy outpouring, a saying and re-saying. It was meant to allow a river of feeling to flow without apology or justification. When we have to let go of a loved one, all our usual attempts to appear rational and grownup, even artful, seem ineffectual. We are the child again wanting it please, please, please. DEB: I was surprised to find myself using “palms” but at some level I wanted to invoke a resurrection again, that late in the game when I should have been able to just let him go. Jesus’ palms were scarred by his crucifixion in all the images from my childhood. I also wanted the palm raised up before my face, as in a goodbye gesture, a gesture that might soften the jangling of the phone with the bad news and give us one last moment of communication and understanding. One thing my brother and I both did was write songs so the ink was right there. He was a guitar player and somehow I always found those chords, his music, a wonderful wave, a flow of sound. Riverlike. DL: The poem invites an oral reading, but I hear its music in my head. How much attention did you pay to the music? How did you achieve it? DEB: You notice all the things a poet hopes will work. The music in the poem hopes to claim the music in prayers, in rituals, in spells. As I worked on it, I spent a lot of time saying it aloud, and revising. That kind of sound rehearsal is something you cannot do enough of, and I am always sorry when I read something in public that seemed quite good on paper and hear something that lets me know I sent it out before I had done all the work. It hurt to read this out loud, over and over, of course. I kept finding myself reaching for the Kleenex box and trying to stifle the tears as I worked. When I could read it while I was alone without being overtaken by emotion, I read it to my husband, and found myself struggling again. When the words move through the body, we find things out. You didn’t ask this, but I want to say that not too long before my brother died we got to spend a day singing, playing guitar, being our best selves together. He was tired and I knew I should go, but we played on because we both knew we were singing together for the last time. We were privileged to know the hour of our last parting and to say the goodbye my poem seeks. It doesn’t fix everything or avoid pain, but it is a worthwhile thing to do. I hope that someday in our society we will be able to look death more squarely in the face so we can have our goodbyes in a setting that honors the lives we seek to lead and the loved ones we are lucky to have known. It’s a hard thing to do. But then, most good things are. The Poetry Book Giveaway officially ended at midnight last night. With more than 50 poetry blogs participating, each giving away two free poetry books and each having in the area of 50 entrants, it's been quite a lively venture. Thanks to Kelli Russell Agodon for dreaming it up. 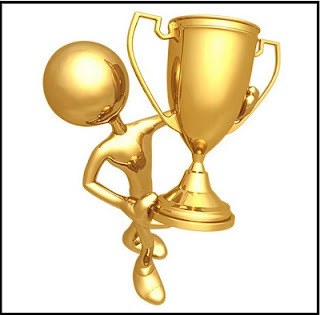 Now I hope that all the winners will read and love their books. If they do, then I hope they'll spread the word by recommending the books to other poetry lovers. Maybe even purchase a copy to give as a gift. Susan Sonnen wins a copy of my book, What Feeds Us. Jennifer Jean wins a copy of Meg Kearney's book, Home by Now. Both books will go out in Monday's mail. If you didn't win, please don't give into despair. I'm cooking up another giveaway to celebrate my forthcoming book. Stay tuned.